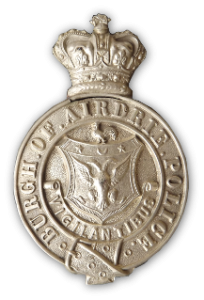 Airdrie Burgh Police was established in 1822 and ceased to exist in 1967 when it amalgamated with Coatbridge Burgh, Hamilton Burgh and Motherwell & Wishaw Burgh to become part of Lanarkshire Constabulary. The first recorded numbers of officers was in 1859 which showed that the force had 11 officers. This increased to 23 in 1900 and 26 in 1910. The final establishment in 1967 was 66 officers. The Burgh coat of arms are a silver coloured shield a two headed eagle below a crescent that has a five point star with a central hole (known as a mullet) on either side and on top of the shield is a cockerel. The burgh motto is ‘Vigilantibus’ meaning ‘Forever watchful’. From records available, it appears that James Gillies was appointed the first Superintendent of Airdrie Police and Keeper of Airdrie Jail with free house, gas, coal and 15/- per week as wages on 18th May 1838. The fortunes of Airdrie Police apparently ran smoothly until 1884 when, on the death of Superintendent Neilson, a letter received from the Chief Constable of Lanarkshire Constabulary stated it was time to amalgamate the Airdrie Police with Lanarkshire Constabulary. The suggestion was not considered and the council agreed to advertise for a Superintendent of Police. On 24th July 1884, Alexander Hynd, Detective Office at Partick, was appointed Superintendent of Police with a salary of £150 per annum. In 1891 George Burt was appointed Superintendent of Police and, on the passing of the Burgh Police (Scotland) Act 1892, he assumed the title of Chief Constable, the name by which the Chief Officer of Police is still known. Modern inventions were now beginning to be employed by the police and the first of these, a telephone, was installed in 1889. The second, a typewriter, was purchased in 1902. The typewriter, however, appeared to be kept in the nature of a secret weapon inasmuch as it was kept under lock and key. Only a favoured few were allowed to use it and then only under the supervision of a superior officer. If any other officer of constable made application to use the typewriter this was flatly turned down as the Chief Constable was apparently afraid that the improvement in the education of members of the force in any shape or form would usurp his authority. Chief Constable Burt died in February 1909 and on 19th April 1909 Alexander Wesley Christie was appointed Chief Constable of the Force. Mrs Waddell, who later endeared herself with the members – so much so that she was known as ‘Auntie Waddell’ – was appointed Police Matron in 1912. After Mr Christie’s appointment to the Chief Constable position, various improvements in the conditions of service of the police were made. Mr Christie was particularly interested in traffic problems and , as a result of his efforts in this direction, the first set of traffic signals in the west of Scotland were erected at the Car Terminus, Airdire, to be followed in 1932 with traffic signals at the New Town Cross and Old Town Cross. 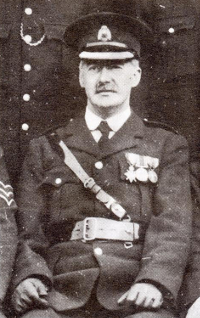 In 1930, the King’s Police Medal was awarded to Chief Constable Christie for his outstanding work in the police service. The retirement of Mrs Waddell took place in 1932 after 20 years of faithful service and another matron, Mrs Wilson, succeeded her. 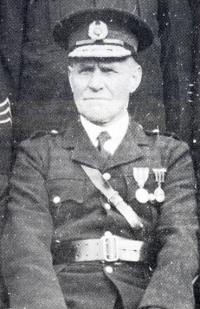 Chief Constable Christie demitted office on 29th May 1933 after 43.5 years of service, 24 years of which he had served as Chief Constable of the burgh force. To succeed Mr Christie, the Town Council unanimously agreed to appoint Inspector James Turner as Chief Constable and on 30th May 1933 he took up the position. On 13th June 1946, Chief Constable Turner was also awarded the King’s Police Medal for his meritorious police service. He retired on 15th April 1951 and was succeeded by Chief Constable R. M. Clark who received the O.B.E. in 1971, and the Queen’s Police Medal in 1970. 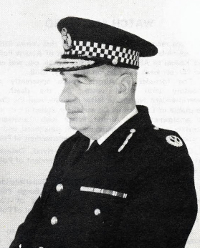 Mr Clark became assistant Chief Constable in Lanarkshire Constabulary on amalgamation of all the Lanarkshire Forces. He retired in March 1971 and died on 18th August 1971. After his succession to the Chief Constableship, Mr Turner was ever alive to the need for the improvement of methods for combating crime and he was instrumental in having the Ericcson Police Pillar Telephone, Two-way Wireless Communications and Telex Communications Systems introduced.